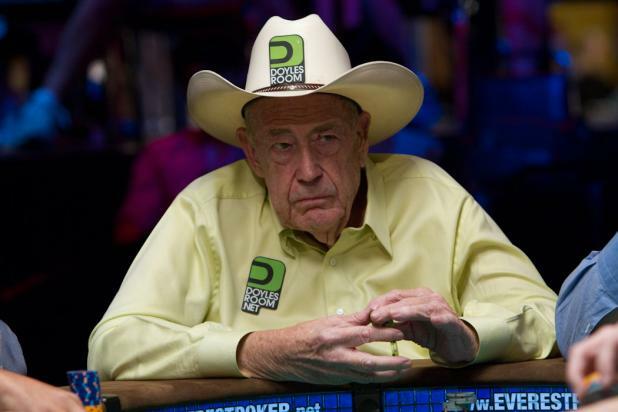 Doyle Brunson may be 76 years old, but he still plays in the highest live cash games in the world. He is also a tournament legend who wrote what many consider the bible for playing poker -- "Super/System," released in 1978. ("Super/System 2" followed up in 2004.) 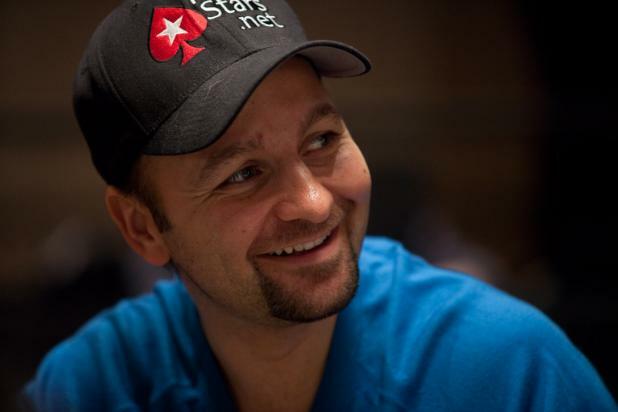 While many sports fans seem to have short memories, and quickly forget about the legends from previous generations, Doyle continues to be a fan favorite -- he received the third-most votes for the WSOP Tournament of Champions, behind only Phil Ivey and Daniel Negreanu. Phil Ivey and Jennifer Harman often compete against each other in the biggest live cash games in the world, but it's rare that they sit next to each other in a major tournament. They're playing this hand together on Day 1 of the WSOP Tournament of Champions. 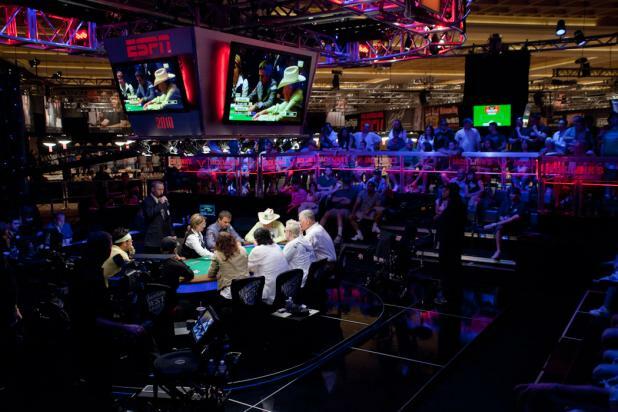 While every table in the WSOP Tournament of Champions is packed with all-stars, it's hard to deny the one that ESPN chose for the main stage would hold the most interest for poker fans. 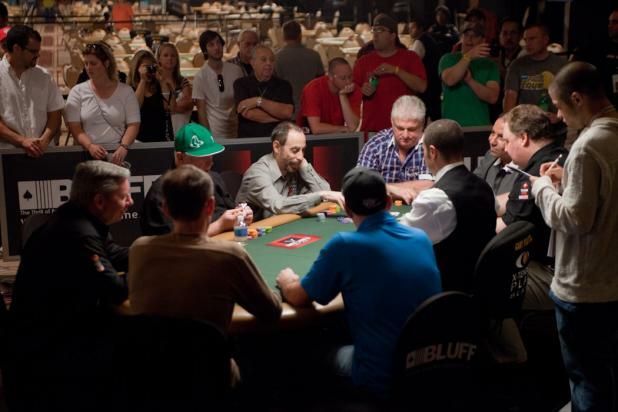 The players, in seat order clockwise from the dealer: (1) Joe Hachem, (2) Doyle Brunson, (3) Howard Lederer, (4) T.J. Cloutier, (5) Bertrand "ElkY" Grospellier, (6) Scotty Nguyen, (7) Annie Duke, (8) Daniel Negreanu, and (9) Antonio Esfandiari. Another all-star table that couldn't receive full ESPN coverage on the main stage. 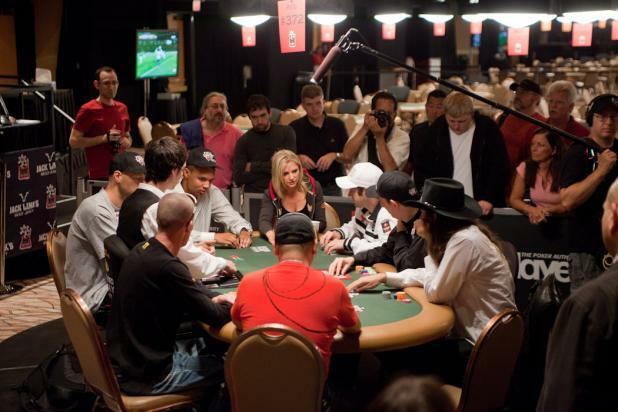 This table includes fan favorites Mike "The Mouth" Matusow, Dan Harrington, Barry Greenstein, Allen Cunningham, and Greg "Fossilman" Raymer, among others. Who Do You Need At Your Table To Be On ESPN? With a lineup that includes Phil Ivey, Jennifer Harman, reigning WSOP Main Event champion Joe Cada, and Chris "Jesus" Ferguson, this table in the WSOP Tournament of Champions feels like a featured table. But it was assigned one of the outer tables, and another was chosen for full ESPN coverage. In any other event, this table would be legendary. WSOP Tournament Director Jack Effel (standing, right) welcomes everyone to the start of the 2010 WSOP Tournament of Champions. Mike Sexton (standing, left), who was voted into the Poker Hall of Fame last year, will be giving the opening announcement to "Shuffle up and deal." Sexton won the most recent WSOP Tournament of Champions, back in 2006. As a former TOC champion, Sexton gained automatic entry into this event. 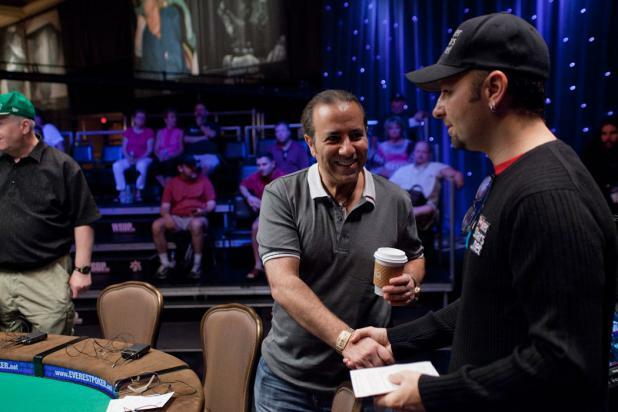 Sammy Farha wishes good luck to Daniel Negreanu (right) shortly before Day 1 of the WSOP Tournament of Champions begins. 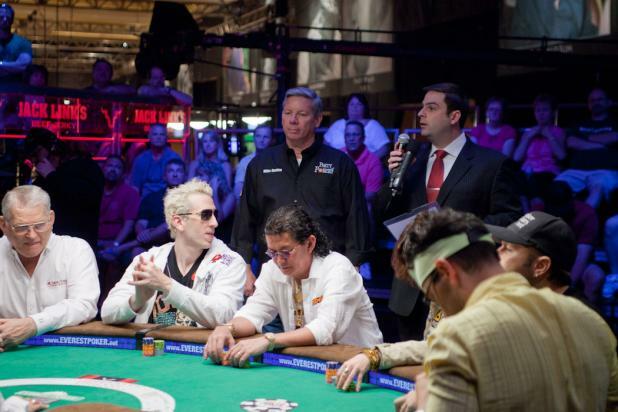 Both players were voted into the million-dollar freeroll tournament by poker fans. 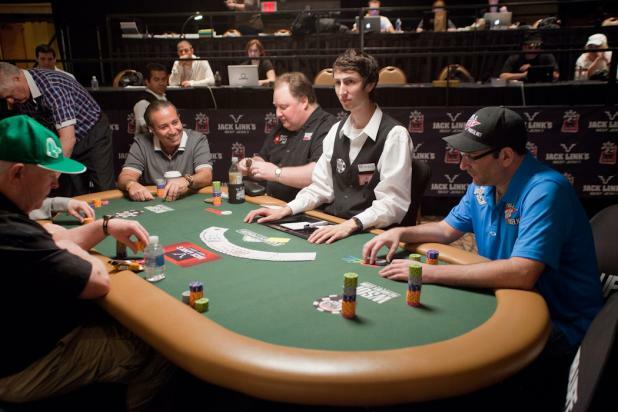 The WSOP Tournament of Champions begins with 27 players at three tables. There is a featured table on the ESPN stage, along with two outer tables, including this one. Sammy Farha (smiling, left) chats with some of the other players before play begins on Day 1. 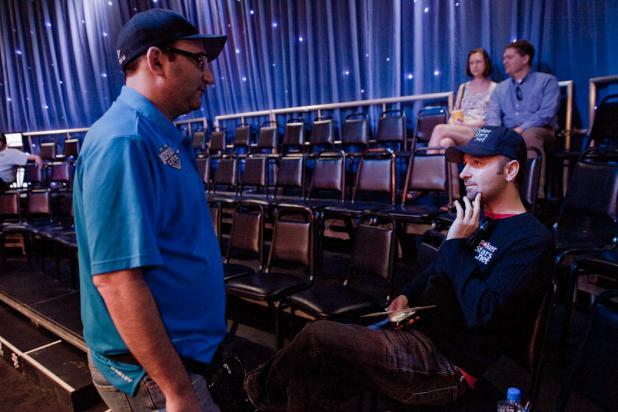 Mike "The Mouth" Matusow chats with Daniel Negreanu before the start of Day 1 of the WSOP Tournament of Champions.